Last night Andrew decided to give the lesson for family home evening. He then commenced telling the story of Noah. He did a great job. It went something like this... Jesus told Noah to build a boat. 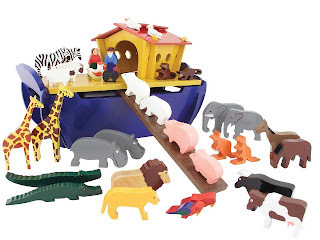 (He then described the boat in length, I think he was describing the Fisher Price Noah's Ark that my sister has.) Then he put all the animals on it. The mommy giraffe, daddy giraffe, and baby giraffe. Plus the mommy zebra, daddy zebra, and baby zebra. Then it rained. The end! I just wanted to wish my hubby a happy birthday. I didn't get the post up yesterday because we had to do all our birthday fun. Out to lunch, homemade pizza and smoothies for dinner and rook with Grandma and Grandpa Tootsie! I love you Dave, you are the best! Is it wrong that every time Andrew and I go to the library, which is once a week, I go check out a Berenstain Bear book for me? Camille and baby food equals love. She is much happier when she is full! The only picture of my birthday. You gotta love it. Andrew and Dave making me a cake. Andrew's 3rd Birthday. We went sledding on Saturday. He opened his presents before church on Sunday. Then we had a Curious George party that night, complete with monkey cupcakes and the man with the yellow hat.